Welcome, and thank you for visiting the website of the Guild of NH Woodworkers. As you look through this website, you will see many photos of members work and of our members engaged in activities. These are but a sampling of what makes us strong. It has always been an article of faith among us that from the rankest beginner to the most accomplished professional, we all have something to both teach and learn from each other. If you are a woodworker or would like to take up our hobby and avocation and become a woodworker, we invite you to join us and become a member. Our guild, despite its name, is not an organization only of professionals, it is open to all. Our primary mission as an organization is education. We are an IRS recognized 501(c)3 non-profit and we meet our obligations to the public through a grant program and by running lectures, symposia, and demonstrations which are open to everyone. 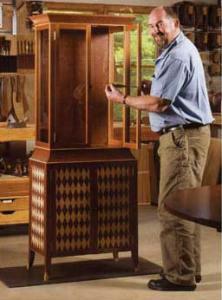 The primary focus of most members, both professional and amateur, is furniture design and construction. 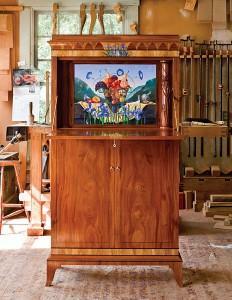 The Granite State Woodturners, a subgroup of the Guild, cover both bowl and spindle turning. We also have members who restore old houses and antique furniture, build kitchen cabinets, create small wooden gifts, miniature doll house furniture, and produce wooden boats and canoes. Some members carve ornamentation on panels and doors while others are wood sculptors. If you are serious about woodworking, this is the place to be. Our wide range of programs includes member run groups focusing on making stringed instruments (Luthiers), pre-industrial age furniture (Period Furniture), an instructional group for beginners (BIG), and turning at the lathe (Granite State Woodturners). Each and every year there are over 30 events and opportunities for our members to improve their skills and learn from each other. We are proud of what we offer each other, and prouder still that our success has seen us grow from 15 isolated professionals meeting to explore starting an organization, to a vibrant organization with over 500 members in New Hampshire and the adjoining states.